I have no idea why.. But lately I have been obsessed with snakeskin. No, I would never wear something snakeskin (real or fake.. I am pretty sure I wouldn't.. ah geez!) - but the idea of it seems rad.. 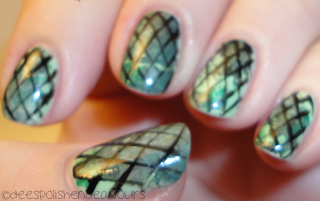 I looked at some images online of snakeskin nails - most either used stickers, konad or mesh. I have 1/3, and none of my plates would give me the results I wanted. Now. I didn't have mesh.. but I did have lace. I mostly wanted something to lay under where I was going to sponge for texture.. And this is the result.. I even included a snapshot of my rarely photographed right hand.. Looks fairly scary.. The only reason that photo is included is to show that the base colour I used was more prevalent on that hand - and I like that. After my base was dry, I put lace over my fingernails and sponged on top of it.. I started by sponging one colour at a time.. But have more fun just mixing and matching afterward.. I am really not too sure if the awesomeness of these bad boys shows through via these photos, BUT, I am quite in like with them. Sorry I disappeared for a bit there. Apparently working these extra shifts is sucking my will to live. That paired with the gym, my brother's hockey games and a sad attempt for a social life equal no time for blogging. Bad me, I know! I hope everyone has been having an amazing week and that is continues through to the weekend! I am off to get ready to go have a Jersey Shore/Movie Evening with a friend. Then it is back to work tomorrow.. bleh!! 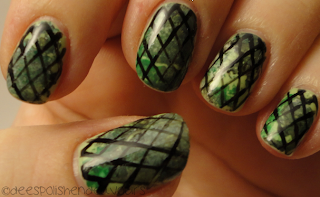 Aurora's Nails - No, no it is not. Now I am the complete opposite. I could literally sleep at any given moment. Silly body - make up your mind! And thank you!! 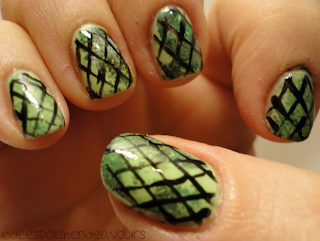 Deez Nailz - I am always practicing that sweet, sweet zebra stripe.. Same goes for Cheetah print.. At least we all can do decent fakes, right? And I saw it! You did an amazing job!! 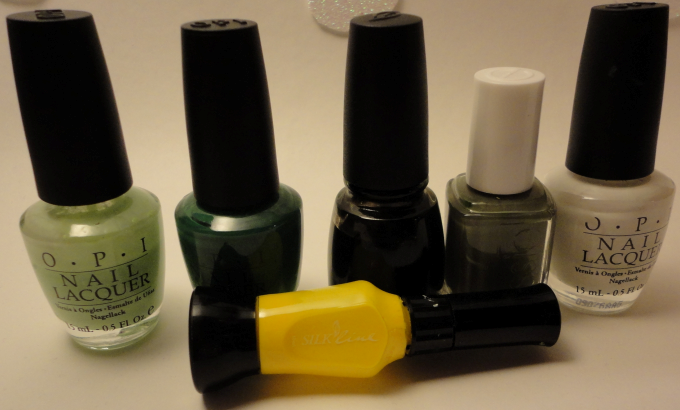 you have so much patience to do these nails..so many colors sponged on @_@. did u just go randomly at it or did u do darker colors then lighter colors?